These are 2 pics of 7 count 'em 7! 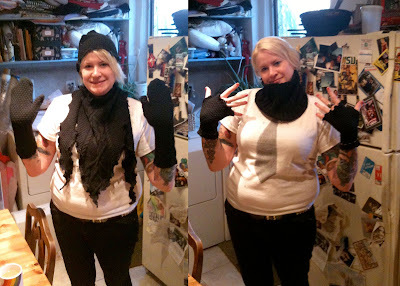 things I made out of one old sweater. Mittens, wrist warmers, neck warmer, hat and scarf! My awesome Aunt Denny gave me some old sweaters to play with and I tried to make as many things as I could without wasting any. After I did this for myself, I made a set for my friend for Christmas! You're eco-chic! SO much fun! I am diggin my SHOUT OUTS!! !